The variety of so-called “energy drinks” being offered has become staggering. Available everywhere from grocery stores to convenience stores and gas stations, these oversized caffeine-filled drinks, which are formulated to keep you going at a rate that would make the Energizer Bunny look like a slacker, have infiltrated our everyday lives. Coffee is no longer the stimulant of choice for the young person on the go; instead, it has been replaced by cans of instant liquid energy going by the names of “Monster”, “Full-Throttle”, “Rockstar”, and “Burn”. Of course, the added danger of these drinks is the addition of alcohol. When energy drinks are mixed with alcohol, the combination can be particularly hazardous as it can interfere with the body’s natural defenses that would normally guard against over-indulgence, and can literally kill the drinker. Some energy drinks out on the market now even contain alcohol, and many of these cans are hard to distinguish from the non-alcoholic energy drinks. The natural marketing campaign that the energy drink companies tend to gravitate to is the teen and young adult market. The lack of knowledge on the parents’ part regarding the facts about these drinks, coupled by the drink companies’ often irresponsible advertising campaigns of their unregulated product can lead to some disastrous results. The most irresponsible advertising campaign out there right now has got to be the energy drink mix called “Blow”. When I first found out about this, I was totally dumbfounded. When I did a little more research on the product, I was even more flabbergasted at not only the total disregard to responsibility in advertising going on with this product, but also the total disregard in that matter within the owner of the company’s flimsy justification of his product. “Blow” is a powdered energy drink mix that can be added to your favorite beverage (a bottle of water would be preferable, but the powder can be added to any drink, non-alcoholic and alcoholic alike) to give you that extra boost commonly related to energy drinks. “Blow” has 240 milligrams of caffeine; twice the amount of many cups of coffee and 10 times the amount of a can of Barq’s Root Beer. But, as already stated, what is more shocking than the amount of caffeine present in this drink, is the way it is marketed. “Blow” is sold in vials, and the mandatory weight of the package is given in grams. When you buy “Blow” the powder comes with a phony credit card and a small mirror to cut up the powder before adding it to your drink. The website and the packaging of the product itself incorporates scantily-clad women and lines of the white powder resembling cocaine haphazardly spilled across a table. 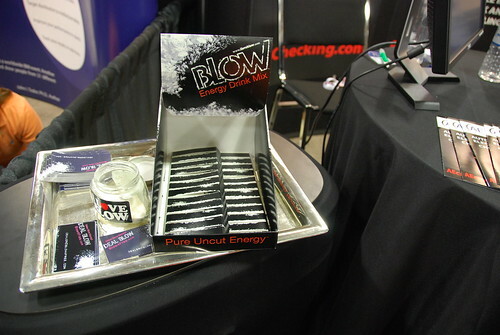 Packaging for the energy drink mix called “Blow” — made to look like cocaine and paraphernalia. While “Blow” is supposed to be sold to people 18 years or older (and it says this right on the package), on the various retail websites where “Blow” is available, rarely, if ever, is this fact stated. In fact, you would be hard-pressed to even find that requirement on “Blow’s” website as well. People buying “Blow” online have three choices of different sized packages to choose from. There’s the “Stash Box Sampler Pack,” the “Recreational User Pack,” and the “Fiender’s Hook-up” which comes in a Styrofoam container manufactured to look like a brick of cocaine. Logan Gola, the creator of “Blow”, has been interviewed numerous times since his product’s launch in 2007, and has upheld his idiotic position by saying he and his company are “spoofing” the drug culture with advertising that is (and, in researching this, I swore I would get ill if I heard him say this combination of terms just one more time…) “cool, edgy, and fun.” Mr. Gola needs to be informed on the definition of the word “spoof.” Anything that is spoofed involves humor or satire. I defy anyone to find anything funny in the way this product is being represented to the teens of America – or even to the adults for that matter. Apparently, I’m not the only one offended by Gola’s blatant disrespect for responsible advertising. He has received death threats because of the way he has thumbed his nose to his critics, and while I agree that he is an irresponsible businessman, sending death threats to the man discredits your argument, and makes the person delivering the threat just as irresponsible as Gola himself. 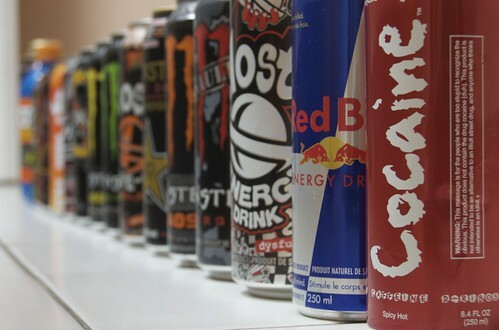 All of this begs the question, should energy drinks carry warning labels like cigarettes? Perhaps they should, if for no other reason, to bring the dangers inherent with these drinks more to the attention of the user and, in some cases, the user’s parents. As already stated, some people add their energy drinks with alcohol. Bars are now serving them as standard drinks (ever hear of a Red Bull and Vodka?). These drinks are very popular on college campuses, and, as Roland Griffiths, a professor of behavioral biology, told the New York Times, “Alcohol adds another level of danger. Caffeine in high doses can give users a false sense of alertness that provides incentive to drive a car or in other ways put themselves in danger.” Mix that with the fact that the driver could also be impaired by the alcohol, and you have a very dangerous situation on the road. Plus, as stated earlier, the person mixing energy drinks and alcohol doesn’t even have to be driving to put himself in danger. The energy drinks can keep a drinker stimulated and drinking longer when, in a normal situation, the drinker would have passed out, or the body’s normal defenses would have kicked in. Instead the energy drink / alcohol drinker continues to party and drink, vulnerable to alcohol poisoning and death. It’s hard enough, the challenges our kids face in society these days. It’s even harder, as a parent, to keep a watch on and regulate these challenges. Do we really need more obstacles to tackle like Logan Gola’s irresponsible product or unregulated caffeine content in energy drinks in general, all of which are easily accessible to our kids?